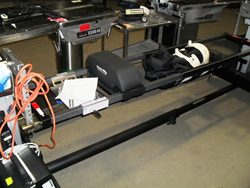 A live auction selling over 4000 pieces of medical equipment will take place next Tuesday, March 17 and Wednesday, March 18 in Chicago, IL. A few highlights of the sale are: a Jackson Mizuhosi 5803 Spinal Table, a Jackson OSI 5890 Ortho Table, a GE OEC Mini 6800 C-Arm, 2 Sarns Terumo 8000 Blood Perfusion Systems, 2 Complete Olympus CV-180 Towers and more! A live auction will be held to sell over 4180 pieces of medical equipment from hospitals, surgery centers and other medical facilities around the United States. Various types of equipment will be sold including radiology, surgery, endoscopy, lab, anesthesia, exam and much more. The live auction will take place Tuesday, March 17 and Wednesday, March 18 starting at 9:00am CDT on both days. The equipment is at their Chicago warehouse located at 1400 N. 25th Avenue, Melrose Park, IL 60160. Anyone can participate in the auction including those who cannot make it on-site. Centurion Service Group offers online simulcast bidding, as well as theater style bidding. Registration information and the complete list of medical equipment can be found on their website, http://www.centurionservice.com.